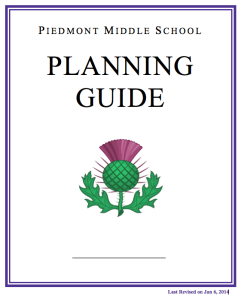 The Piedmont Middle School Planning Guide contains information on grade-level scheduling, course descriptions, textbooks for classes, prerequisites and other factors for families to consider when planning their student’s academic program. Course requests for the upcoming year are made through our student information system, Infinite Campus, each Winter. Students and parents will need to request primary AND alternate electives. Please read course descriptions before making your selection. We do our very best to get students their primary choices. With that being said, not every student will get their primary elective selections. Please select three alternate electives that your student is interested in taking. Those who do not select any alternate electives are signaling that they are open to any/all electives that PMS offers. Written instructions on the Course Request process are available below. Schedule change requests are accepted the second week of each semester (August and January). We want students to attend their elective course for a week before deciding if they wish to request a change. Students can return signed forms to the office, no emails please. Changes can be made if there is space available in the elective they are seeking to add. Changes may affect placement of other courses. We seek to keep students with their same academic teachers all year. There is a strong possibility that changes cannot be reversed once completed. Schedule Change Request Week is a time for students to reconsider elective offerings only. Requests for specific teachers or alternate class periods are not accepted. We believe that every student has a unique combination of gifts and talents. When discovered, developed and given back to the world, those talents will provide that student with a sense of accomplishment and personal worth. The role of the Counselor is to help and encourage each student to discover his/her own personal strengths in the classroom. The PMS Bell Schedule works on a block schedule. Students attend all 7 classes on Monday and Friday. Tuesday-Thursday classes are longer, so students will attend fewer classes on these days. Students will attend each class 4 times a week. 6th graders will participate in the Elective Wheel, sampling various electives in a rotating format throughout the school year. 7th graders will take three semester electives, with the fourth semester elective being a required Reading course. 8th graders will take four semester electives. PMS has both Band and Orchestra opportunities for student interested in pursuing music education. Students can choose to take a world language as one of their elective choices in 7th and 8th grade. Spanish, French and Chinese are available. The commitment is 1 semester in 7th grade (level A) and 2 semesters in 8th grade (level BC). PMS language levels A + BC = PHS language level 1. Successful completion of A & BC at PMS allow a student to move into language level II in 9th grade. Those who wish to take an AP language course in high school, they will need to start their language track in middle school or move ahead in the pathway by showing mastery of a course. For more information on World Language progression, please look at the World Language Link of the PMS website or by clicking here. PUSD offers various math opportunities for students interested in additional math rigor during 6th through 12th grade. Click here to view the PUSD Math Pathways. PMS students enrolled in CC6, CC7 and CC8 will be receiving grade-level, college preparatory, spiraling math curriculum that revisits and repeats topics to support long-term concept mastery. For most students, this is the appropriate placement. For those seeking additional math rigor and pace in middle school, students can elect to enroll in Compression Math, with an entry point in 6th grade. During grades 6-8, students in Compression Math courses will cover four years of math curriculum. When these students start 9th grade, they will be one year ahead in the math pathway, allowing them to take Calculus during their senior year. Since students will be covering more than one year of math curriculum during the school year, they will have more homework that can go beyond the PMS Homework Policy time limit. Not all students will be successful in these faster-paced compression classes, which will cover more material in class and include more homework and more frequent assessments. Students who do not take Compression Math in middle school will have another opportunity to compress in 9th grade. PUSD offers two entry points into the Compression Pathway (6th grade and 9th grade). Students can compress one time during grades 6-12, so if your student does not compress in middle school, they have the same opportunity to reach Calculus by starting Math Compression in 9th grade. Echoing the advice of many math experts, the District recommends that parents take seriously the decision whether their students should compress and when the best time is to do so. Compression will be appropriate for some but not for others. Also, compression may be too much for a student in 7th grade but appropriate for that same student in 9th or 10th grade. Each compression pathway offers the same opportunity to take Calculus in high school. PMS has various academic support opportunities for students during the school day. Math Lab is a course that provides addition math help for students enrolled in CC6, CC7 or CC8 (not Math Compression). Study Skills is a course that supports students with executive functioning skills and work completion. 6th Grade – Both Math Lab and Study Skills classes are available during the 6th Grade Elective Wheel. Math Lab can be taken in lieu of the Elective Wheel. Study Skills is available as a drop-in class that can be utilized as needed throughout the school year. 7th and 8th Grade – Math Lab 7/8 and Study Skills 7/8 are semester or year-long courses that students can select as one of their elective choices.